Falling Bark Farm Brandy infused Vanilla Hickory Syrup - 8 oz. All natural Hickory Syrup made in small batches. Ingredients: turbinado sugar, hickory bark extract, Brandy and an organc Vanilla Bean! Not too sweet, with a rich buttery caramel taste and subtle brandy flavor with a real kick of vanilla. On Pancakes or waffles for breakfast; but also great as a grilling or finishing glaze on pork, chicken or duck; use in salad dressings, whip cream, cake frosting; drizzle over butternut squash or use as a finish to a baked sweet potato. For you adults try it with a some bourbon and a cherry. The uses are limitless. The base hickory bark extract is made from hickory bark from the shagbark hickory tree in particular which is shed naturally, so as not to harm the tree in any way. This allows the tree to remain a sustainable resource. Once gathered, the bark is scrubbed clean, roasted much like coffee beans to enhance the flavor, put through a proprietary extraction process, aged, and filtered, before introducing a minimally refined cane sugar, turbinado, to develop its exquisite taste enjoyed the world over. Falling Bark Farm Original Hickory Syrup - 12 oz. Falling Bark Farm Vanilla Hickory Syrup - 12 oz. Falling Bark Farm Brandy infused Vanilla Hickory Syrup - 12 oz. Falling Bark Farm Barrel Aged 180 Reserve Cask Hickory Syrup - 12 oz. Falling Bark Farm Original Hickory Syrup - 8 oz. 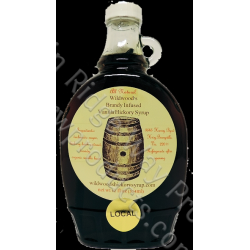 Falling Bark Farm Vanilla Hickory Syrup - 8 oz.